If your little girl is fascinated by Fairies and believes, let her put on her wings and join them. 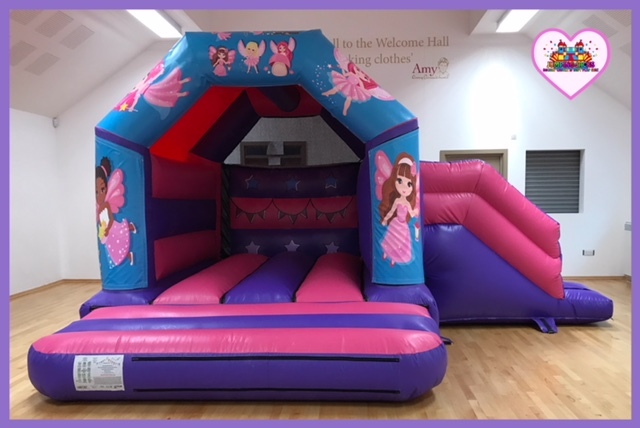 A great inflatable to have at any party, with its pink and blue "Fairy" themed artwork. The Fairy theme will be loved by the Girls and is a great choice for children up to 13 years of age. The fun is sure to be had by all with this great Combi Castle. Jumping Jacks pride ourselves in supplying new equipment to our hirers to make sure the party is enjoyed by all. Our Castles are cleaned after every use and tested to the latest industry standards. All of our Combi Castles are supplied with blowers, pegs / sandbags and safety mats. Please note: All prices quoted are based on a 4 hour period. This Combi Castle is suitable for indoor or outdoor hire and on Grass, Tarmac and Concrete. This Castle cannot be placed on brick paving or concrete slabs. If you are unsure if your garden is suitable please contact us before booking. If it is to be placed on a hard surface outdoors - in order to comply with insurance on any inflatables, it is a requirement to securely anchor to the ground - to do this we will need to drill 10mm holes in the ground. This unit requires approximately an extra 6ft to the rear for the blower, 4ft to the front for the mats and 2ft either side to allow safe operation. Our bouncy castles are available to hire in Belfast and surrounding areas. Jumping Jacks Bouncy Castle Hire © 2018. All Rights Reserved.